any of u gurus know why we stop growing height after a certain age like bros after 21 girls after18.my guess is because our growth hormone secretion lowers big time at that ages. when little kids are growing there spurt is somewhere between 12 ius to 14ius of growth hormone for 4 days 1 time a month,any one else have different opinion. Well, yes it should be noted that all is downhill after your prime years in regards to secretion of gh/testosterone . The cessation of bone growth can be most directly associated with estrogen though. Just like on a cycle, high testosterone levels can have some estrogen conversion. For example, certain adolescents experience gyno simply from the process of puberty, what a cold hearted world we live in Also, estrogen can also explain why males continue to grow after females. 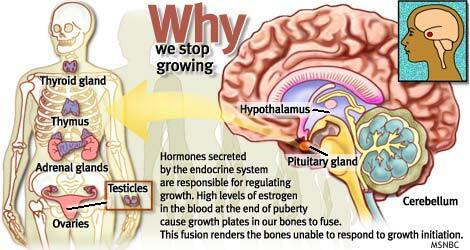 The growth hormone is not what makes you grow taller. It has to do with the growth plates in your bones closing. Why do we stop growing? Ultimately, we stop growing because we are genetically programmed to do so. It is our genes, made of DNA, that determine how we grow and develop. We inherit our genes from our parents when we are conceived, and we maintain this genetic blueprint throughout life. But although our genes control the growing process, scientists still do not understand just how they do it. OUR GENES start working at the moment of conception when a single cell becomes a complex organism in which billions of cells work in concert. Once we are born, we continue to grow and develop until the completion of puberty. At this point our genetic program tells us to stop growing. From an evolutionary viewpoint, once our genes have orchestrated the growth and development of the body to the point that it can reproduce, the purpose for growth is complete. When we think of a growing child, we often picture one who is becoming taller, whose arms, legs and spine are growing longer and whose hands and feet are growing bigger. This is referred to as linear growth. Knowing that our genetic makeup is ultimately responsible for stature, it is interesting to look at the mechanisms that stimulate and inhibit this type of growth. The complex interplay of genes, nutrients and hormones cause bone cells to proliferate at the growth plate of long bones. This interplay is also responsible for the cessation of linear growth and the correlating inability of these cells to further multiply and lengthen bone. 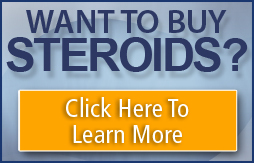 The key hormones in this process are: growth hormone, thyroxin, androgens and estrogen. They are secreted by the pituitary, thyroid and reproductive glands respectively. At the completion of puberty, the reproductive glands in both males and females increase the production of the hormone estrogen. It is the high concentration of estrogen in the blood that causes the growth plates of our bones to fuse. This fusion effectively closes the growth centers of long bones and renders them unable to respond to the hormones that initiate growth. Disorders of the endocrine system can lead to abnormal growth in children and adults. Gigantism, a condition in which a person’s arms and legs grow especially long and height can exceed 8 feet, is caused by the overproduction of growth hormone when the growth plates of long bones are open during childhood or adolescence. Acromegaly is a chronic disease marked by the overgrowth of the hands, feet and jaw. This occurs in adulthood, after the growth centers of the long bones have closed. Both of these disorders are usually caused by pituitary tumors. In gigantism, the tumor develops in childhood and in acromegaly, the tumor develops afterwards. The mechanisms by which organs grow in size are less well understood. “In fact,” says Dr. Scott A. Rivkees, an associate professor of pediatric endocrinology at Yale School of Medicine in New Haven, Conn., “we are just starting to understand the growth-promoting and growth-inhibiting factors of organs. We do know that certain organs have cells that can continue to divide once the organ has reached mature size.” Examples of organs with this capacity are the kidney, liver and intestinal lining. But the lungs and brain do not have this capacity, he says, for reasons that are not completely understood. Last edited by Methuselah; 04-05-2002 at 09:53 PM. I believe it should be noted that the above information refers to genetic disposition with all other chemical variables held constant. Authenticity of our genetic makeup can be manipulated by the presense of an outside (foreign) variable such as synthetic testosterone . Of course the growing process will occur in a proportional manner, but outside variables can alter our genetic makeup and sacrifice such proportions. In essence, the article makes good points but neglects to acknowledge factors that can affect natural growth patterns. study after study indicates GH supplementation for non-GH deficient children is pretty much useless. Maybe one day endocrinology will surpass our natural potential. I am a bit confused by the diagram you attached to your post. According to that pictiure the male testicles seem to be located inside the female uterus. Is this correct? man you guy need to teach a class I swear Im must going to call you the professors.